For a journey that's convenient and cost-efficient, get a T-Money for your Korea trip here. T-Money is a South Korea travel essential that can be used to pay for subway, bus, and cab fares. It can also be used in certain retail stores like Starbucks, GS25, and Dunkin' Donuts. It comes in various forms and designs, so pick the one that suits you. T-Money cardholders get automatic discount whenever they take various subway lines in Korea. Purchase a T-Money card in the airport, subway station, or CVS. Cards are usually sold for ₩3,000 (around ₱150 or $2.8). For convenience (and a discounted rate! ), you can also purchase your T-Money card online here. If you plan to get a Discover Seoul Pass, you don’t need to purchase T-Money since the pass already works as one. T-Money in Korea. Screengrab from Klook. You can now purchase your T-Money card online! You can view the product listing by clicking below or scroll down to the BUY IT! section to see the full product description. Why Buy T-Money for Your Korea Trip? T-Money is a smart way to pay for public transit fares in Korea. It will save you from having to buy single-journey tickets each time you ride the train just like the beep card in the Philippines, EZ-Link in Singapore, and Oyster in London. The main reason why I got T-Money is because it gives at least ₩100 automatic discount (or around ₱5 or $0.09) for bus and subway fares. I know it's not much, but I was able to save ₩3,200 at the end of my first solo trip, which is almost the cost of a tall Iced Americano in Starbucks. With T-Money, you also get free transfers (bus-to-bus, subway-to-bus, and bus-to-subway), provided that you hop in and out of the next leg within 30 minutes. Beyond this time, you'll be charged for multiple trips. I got the AmazingPay T-Money Card. It entitled me to an additional 10% discount on bus routes that connect Seoul and Incheon. It also comes with discount benefits at Lotte World and 63 Square. Before buying your T-Money, know that you can pick the form and design that you'd like. You may opt to get a T-Money in the form of a card, keychain, phone charm, watch, or bag tag. T-Money cards also have various designs that you can choose from, i.e. Kakao Friends, Pokemon, and BTS, so pick whatever your heart desires. To see T-Money cards with exclusive benefits, read more on the official website here. T-Money cards in Korea are sold in convenience stores that have the T-Money logo. You can go to a GS25, CU, 7-Eleven, Ministop, Story Way, or Buy The Way. When I arrived in the airport, I went to the first CVS I saw and purchased my T-Money Card from there. I bought it for ₩4,000 (around ₱200 or $3.7) and requested for an initial top-up of ₩15,000 (around ₱730 or $14), which covered for my all-stop train ticket and subway metro fares for my first three days or so. You can also purchase a T-Money card from ticket vending machines found in the airport transportation center or subway stations. These machines operate in English and are very easy to use. Alternatively, you can also purchase your T-Money card online here to get it cheaper. When your T-Money balance is running low, you can easily top up using the ‘transportation card’ reloading machines found in subways and the airport’s transportation center. To load, simply place your T-Money card on the sensor (it's the middle box below the screen), choose English as your preferred language, and the machine will display the top-up amount options available. Insert your cash (or coins), and you'll be all set to ride the next train. Of course, you can also go to a nearby CVS and request the cashier to reload your T-Money card. How much should I load my T-Money? KTX is the train option for you if you want a faster and premium ride to Seoul Station. All-Stop is the train option for you if you want to pay less to go to Seoul Station. If you’ll go farther than Seoul Station, i.e. Myeongdong Station or Dongdaemun History and Culture Park, you’ll have to load an additional amount of at least ₩1,250 (around ₱57 or $1.1) on top of your KTX or All-Stop Train Fare since you’ll be switching lines. The basic fare covers a travel distance of 10 km or less. An additional ₩100 (around ₱5 or $0.09) is charged for every 5 km traveled within a distance of 10-50 km, and ₩100 for every 8 km traveled with a distance of over 50 km. Gamcheon Culture Village in Busan, South Korea. Section 1 rates cover a travel distance of up to 10.5 km only. Section 2 rates apply for those traveling a travel distance of more than to 10.5 km. Section 1 rates cover a travel distance of up to 10 km only. Section 2 rates apply for those traveling a travel distance of more than to 10 km. Do note that T-Money cannot be used to pay for your inter-city train transfers, i.e. Seoul to Busan or Daegu to Daejeon. T-Money can only be used to pay for the subway lines within each city. Blue Buses run on major highways in Seoul. Green Buses travel shorter distances and stops at subway stations. Red Buses are express buses that travel from Seoul to suburban areas. If you’re unsure which bus to take, you can always refer to Google Maps. This is your average cab. Usually orange or silver. It's the cheapest option, but there is a 20% surcharge that applies for late-night trips (12mn to 4am). If you want to have more legroom, go for the deluxe. It usually comes in black with a yellow sign on top. No late-night surcharge applies. This type is ideal for large groups (6-10 people). Card payment is available. There is no applicable late-night surcharge. For standard cabs, a surcharge of 20% applies during late-night hours (12mn to 4am) and/or when you're headed somewhere outside the city (30% applies if traveling out of Busan). For deluxe or jumbo cabs, no surcharges are applicable. 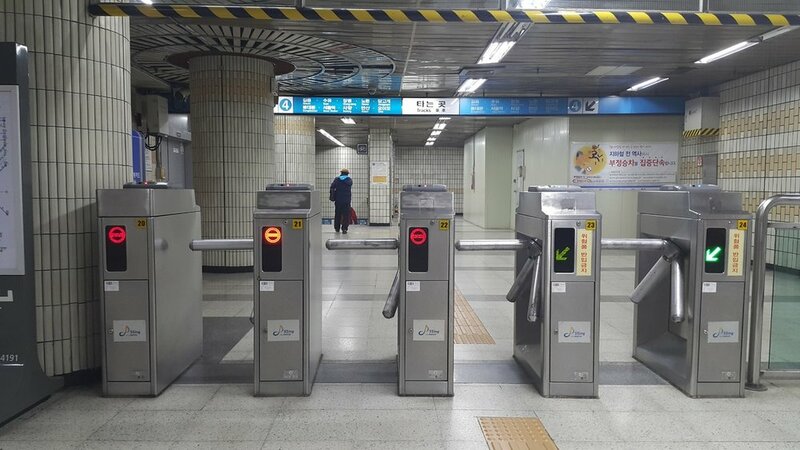 Turnstiles at a Seoul metro subway station. When riding the bus, place your T-Money card on the sensor until you hear it beep. You'll then see the charged amount as well as the remaining balance of your card. Before getting off, make sure to tap your T-Money card on the sensor by the rear doors to get the discount or free transfer. The process is basically the same when using the T-Money in the metro subway, except you'd have to tap your card on the sensor found at the turnstiles. If you plan to use your Korea T-Money card in a taxi, inform the driver that you want to pay with it before getting in. If their vehicle is equipped with the function, you can then tap your T-Money on the sensor, which is usually located between the two front seats. If your balance isn't enough to cover the expense, you can pay for the amount you're short using cash. If you have a remaining balance of ₩20,000 or less in your T-Money card, you can go to a partner CVS and get a refund. The amount that you will get back will be your balance less the service fee (around ₩500). If you have more than ₩20,000 left in your T-Money and want a refund, you'd have to drop by T-Money's headquarters. As of March 2019, you can now purchase a pre-loaded T-Money card online. Introducing the Klook T-Money Card for Korea. Screengrab from Klook. Make your South Korea trip hassle free with convenient cashless payments using the Klook T-Money Card! This integrated transportation card is one of the most versatile stored value electronic cards that can be used not only in public transportations, but also in various convenience stores and vending machines throughout South Korea. Pick up your Klook T-Money Card from any of the pick-up locations upon your arrival and enjoy a pre-loaded value of ₩5,000 that comes along with the purchase. Don’t worry if you end up having unused balance in the card, the Klook T-Money Card is valid permanently and any maintaining balance can be stored for 5 years. Have the perfect souvenir from South Korea with this exclusive Klook design Money Card decorated with iconic South Korean emblems. As an alternative, you can purchase a Discover Seoul Pass, which can be used as a T-Money card. Buying the pass will not only give you discounts when you ride the bus, subway, or cabs, but will also give you automatic admission to more than 30 attractions in Korea. Still need convincing for you to buy online? You can get more discount if you make your purchase with a Klook promo code. See the list of available codes here. 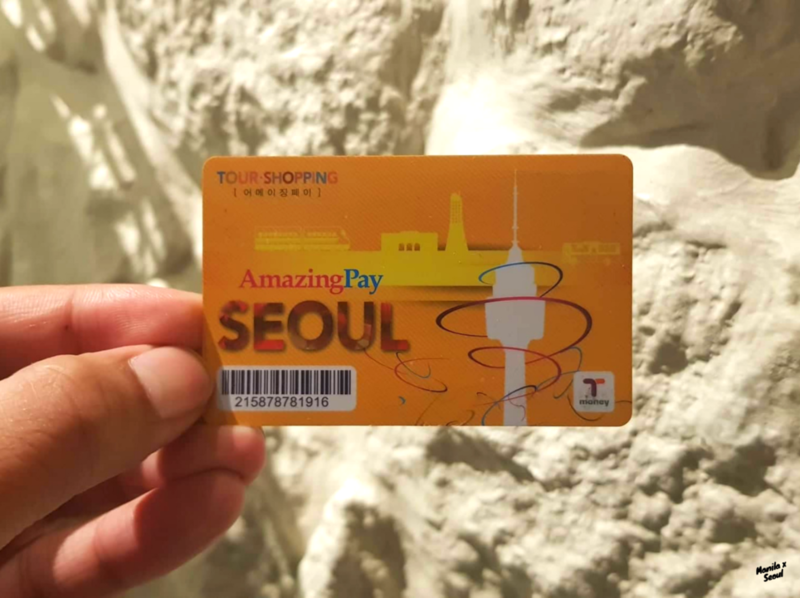 If you're availing a Discover Seoul Pass, you don't have to buy a separate T-Money card since it already functions as one! The free transfer within the 30-minute timeframe is only applicable if you actually transfer. If you're hopping into the same numbered bus or re-entering the same subway station even within 30 minutes, you'll still be charged. Tap, tap, tap. Don't forget to tap your card on the sensor when you get off the bus. If you don't, you will not be able to get the transfer discount. Our friends from Patar TV shared with us a video on how they used T-Money to save some bucks in their trip. Watch their hilarious video here! T-Money cards don't expire. Hence, you can use it the next time you go to South Korea. Where Can I Use T-Money in Korea? 7-Eleven & CU in Korea. Aside from T-Money, you can also consider getting other e-money cards, such as Cashbee and Korea Railplus Transport Card. From what I read, both cards function the same way as T-Money, however they're not as popular as T-Money among locals and tourists alike. If you're renting a car, you can use Korea Railplus Transport card to pay for parking.